With Application of Nonlinear Systems in Nanomechanics and Nanofluids the reader gains a deep and practice-oriented understanding of nonlinear systems within areas of nanotechnology application as well as the necessary knowledge enabling the handling of such systems. 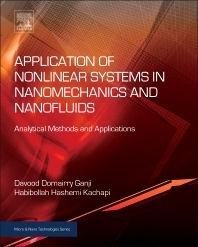 The book helps readers understand relevant methods and techniques for solving nonlinear problems, and is an invaluable reference for researchers, professionals and PhD students interested in research areas and industries where nanofluidics and dynamic nano-mechanical systems are studied or applied. The book is useful in areas such as nanoelectronics and bionanotechnology, and the underlying framework can also be applied to other problems in various fields of engineering and applied sciences. D. D. Ganji is a Professor of Mechanical Engineering and the Director of the Graduate Program at Babol Noshirvani University of Technology in Iran, as well as a consultant in nonlinear dynamics and the Dean of the National Elite Foundation of Iran. He has a Ph.D. in Mechanical Engineering from Tarbiat Modarres University. He is the Editor-in-Chief of International Journal of Nonlinear Dynamic and Engineering Science, and Editor of International Journal of Nonlinear Sciences and Numerical Simulation and International Journal of Differential Equations.